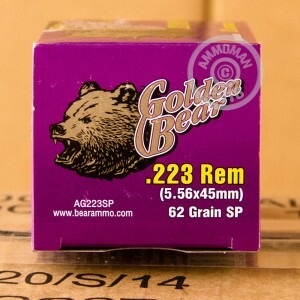 Priced for both inexpensive pest control and target shooting, this .223 Remington ammunition from Barnaul's Golden Bear series features brass plated steel cases that deliver cost savings and clean firing. 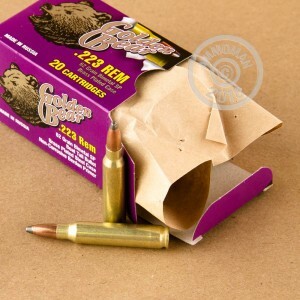 Each round fires a 62 grain soft point bullet at a muzzle velocity of 3,050 feet per second, more than enough to ensure good expansion against most animal targets. The Barnaul Machine Plant is named for the city of Barnaul, Russia. During World War II, the plant produced half of the Soviet military's ammunition supply. Barnaul ammo is some of the cleaner-firing steel-cased product on the market, but remains highly economical due to the low cost of iron ore (and therefore steel) in Russia. These cartridges use non-corrosive Berdan primers and come in a case of 500. Buy this case or any other items priced over $99 at AmmoMan.com to get free shipping! I had no feeding failures. Accuracy at 100 & 200 yards was decent. The rest I shot off was a bit less than perfect so I am reluctant to be critical. Barrel is a 1-9 twist. Will update review as I shoot more of them with a better rest and other rounds to compare (new gun, first firing).